Tangshan, 1976. Two seven-year-old twin children are buried under the rubble of a devastating earthquake. The rescue team explains to their mother, Li Yuanni, that freeing either child will almost certainly result in the death of the other. Forced to make the most difficult decision of her life, she finally chooses to save her son Fang Da, the male twin..
Sichuan, 2008. 32 years later, when the Sichuan earthquake takes more lives, Fang Deng, the daughter, returns to China as a volunteer with a rescue team. The process of witnessing other people’s suffering at the time of a natural disaster helps her to overcome her own trauma and forgive her mother. She finally reunites with her family after 32 years apart..
AFTERSHOCK is China’s highest grossing domestic film ever in China and was the country’s official selection for the 2010 Best Foreign Picture Oscar®. 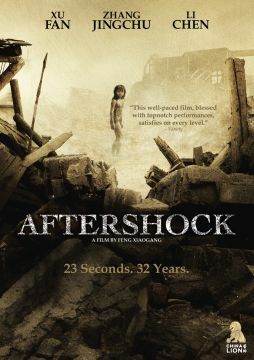 Described by The Hollywood Reporter as a “Chinese Sophie’s Choice,” AFTERSHOCK tells the story of a fictional family torn apart by the Tangshan earthquake, an actual catastrophe in 1976 that killed at least 240,000 people. Directed by Feng Xiaogang (If You Are the One), the film is inspired by the novel, “Tangshan dadizhen” (“Great Tangshan Earthquake”) by Zhang Ling, and stars Xu Fang (The Founding of a Republic), Zhang Jingchu (Night and Fog), and Li Chen (Assembly) as mother, daughter and son. Chen Daoming (Infernal Affairs 3, Hero) portrays Fand Deng’s devoted step-father, Wang Deqing.. 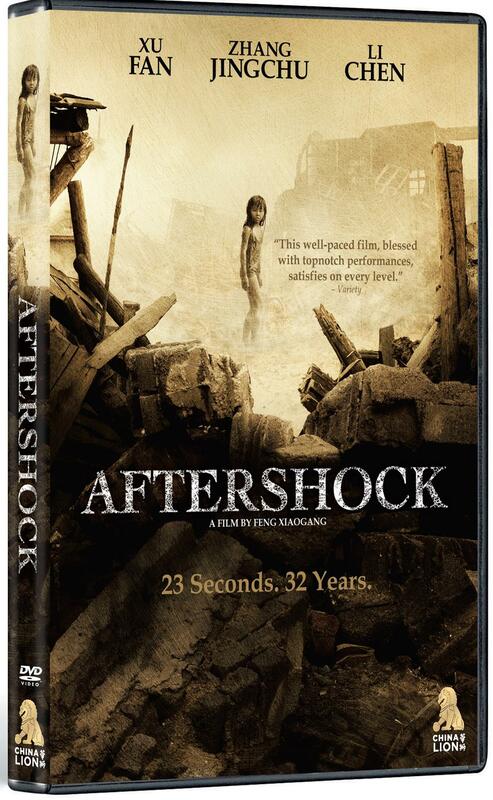 Releasing on Cable VOD, digital platforms and DVD for the first time in North America day-and-date on October 18, AFTERSHOCK is the first title from New Video’s new partnership with China Lion Film Distribution. Cross-platform releases coming up on November 15 include If You Are the One: Love & Marriage, also directed by Xiaogang, What Women Want, a remake of the Mel Gibson-Helen Hunt film starring Andy Lau and Gong Li, and The Warring States, starring Hong-lei and Francis Ng.